WHEN: September 12 – October 14; OPENING RECEPTION: SATURDAY, SEPTEMBER 16, 2017, from 6 p.m. to 9 p.m. FEATURING OVER 100+ PIECES OF ART FROM DOZENS OF REGIONAL UNDERGROUND ARTISTS! The Trenton Punk Rock Flea Market continues its quest to reinvent Trenton as an Arts Destination with its second annual curated gallery show, titled RISE ABOVE: Art of the Counterculture. Curated by TPRFM founder Joseph Francis Kuzemka, Artworks' Exhibits Coordinator, Addison Vincent and key members of the TPRFM team, this group show will feature dozens of ground-breaking artists from around the tri-state area and will encompass a variety of styles from assemblage, photography, sculpture and painting to street art, taxidermy and more. 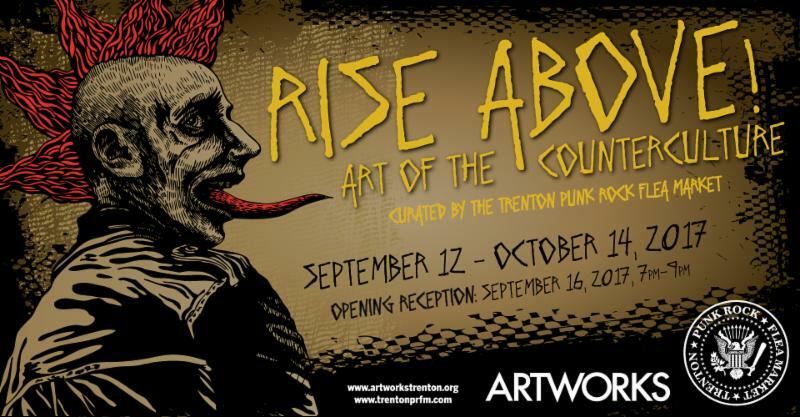 Celebrating the underground arts scene and building upon the network of artists that the Trenton Punk Rock Flea Market has built over the past four years, RISE ABOVE: Art of the Counterculture will highlight the very best in the current art community including artists from the entire region. With nearly 500 submissions and dozens of selected contributors, this is just a small sampling of the nearly 100+ pieces of gallery-quality art that will adorn the walls of Artworks at the official opening on Saturday September 16, 2017. "We couldn't be any more excited to continue our long-standing relationship with Artworks Trenton and to host our second annual gallery show with them," said Kuzemka. "Once again we've assembled an amazing selection of artists from the entire region who we feel truly represent art that may not be considered socially acceptable by the arts elite... Artists who truly rise above the mainstream. These are the artists of the underground," he said. The next Trenton Punk Rock Flea Market will take place at the Historic Roebling Machine Shop, 675 S. Clinton Ave. in Trenton, on October 21-22, 2017, from 10 a.m. to 5 p.m., with over 200 different vendors and a dozen different food trucks. $5 admission. Web site: www.trentonprfm.com.